The color of the normal bowel movement is any shade of brown (ranging from a light bown or tan to darker brown hue). When stool appears a very light brown to yellow brown or even overtly yellow then it needs to be assessed further. Yellow stool does not always indicate a problem. Sometimes consuming foods and beverages with a strong yellow color/dye can taint the stool a yellow color if the dye is not digested or altered as it moves through the bowel. The characteristic brown color of stool is largely due to red blood cell breakdown in the body and the activity of the liver. When red blood cells are broken down, as part of the normal life cycle of these cells, the pigments within it are processed by the liver yielding a substance known as bilirubin. It has a characteristic yellow color but is converted to a brown color within the bowel. Without this contribution, stool may be a range of different colors depending on the food that was last consumed and may be significantly paler or even whitish in color without the contribution of the liver. The other contributor to this brown color is the bacteria that naturally reside in the large intestine. If there is a disruption of this bacteria within the bowels it can also alter the natural color of stool. In diarrhea, food travels through the intestine faster than normal. Therefore normal digestion and absorption are interrupted. One of these processes that causes stool to have its normal brown color involves the intestinal bacteria which usually convert bilirubin in bile into stercobilin. It is this stercobilin that gives stool its normal brown color since bilirubin has a strong yellow color. Therefore the watery stool may have a yellow color. It is possible for this to occur with any cause of diarrhea, such as infections, food intolerances and inflammatory disease of the bowel. 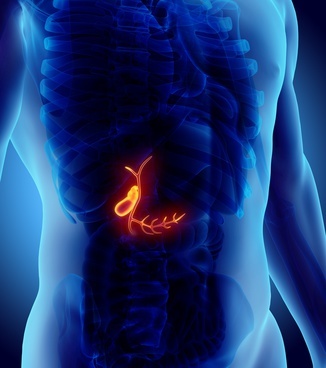 The gallbladder stores bile and secretes it in controlled amounts into the small intestine to aid with digestion. However, sometimes this controlled secretion is not possible, especially when the gallbladder has been removed. Cholecystectomy is a common procedure where the gallbladder is removed. It is often done when gallstones cause an obstruction of the bile duct. The lack of a gallbladder may lead to constant secretion of bile into the intestine and this can result in yellow-colored stools. However, if the action of colonic bacteria the stool may be converted to a brown color. Cholestasis (Gk. chole = bile, stasis= standing, meaning not flowing) is a condition where bile produced by the liver is greatly reduced or not passed out of the liver at all. Normally bile is stored in the gallbladder and passed out into the stool. It is the bile that contains bilirubin which has a yellow color but when broken down it causes stool to have its characteristic brown hue. Read more on cholestatic jaundice. Common symptoms in a liver disease are nausea and tenderness or pain in the upper right abdomen. Common symptom in gallbladder/biliary duct disease is cramping pain in upper right abdomen, below the ribs. The abdominal cavity is congested with various different organs and structures. Therefore an abnormality in one organ can affect neighboring organs. An abdominal tumor (like fibroma) or tumors in neigboring organs may press on the bile duct thus causing cholestasis and yellow stools. This type of bile duct compression may present with symptoms of reduced bile outflow like pale stools or jaundice, as well as symptoms associated with the organ affected by the tumor. Several pharmaceutical drugs can affect bile production and outflow thereby leading to jaundice and pale or white stools. These drugs cause a condition known as drug-induced hepatitis. In addition a range of other non-therapeutic substances may also have a similar effect on the liver and bile production. This includes toxins like certain pesticides or heavy metals, illicit substances and alcohol. The latter may cause alcoholic hepatitis and is one of the leading non-infectious causes of liver problems.